I'm lucky enough to be sent books by certain publishers with a view to reviewing them. Of course it's not possible to read them all, so I pass some on to people to whom I think they may be of interest. Fortunately, I know quite a few people who live or work with children with special needs! 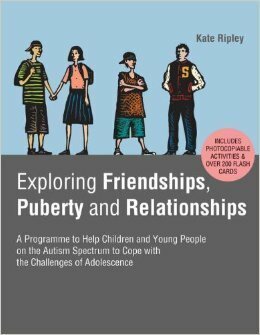 Tackling the issues of growing up is hard enough with Neurotypical children, so having a resource like the book Exploring Friendships, Puberty and Relationships, which approaches the subject with the autistic spectrum child in mind, is a great starting point. The book is meant to be used as a teaching resource in a school environment and the topics it included were relevant and clearly laid out. I liked the fact the resources needed were provided in the book so there was no need to search for them online or make your own. Although I have no doubt it would be well received – the author writes that it ‘evolved with the help of feedback from both students and facilitators of the programme’ – I was only able to try the suggested tasks at home with my son. He is 13 with a diagnosis of Aspergers and I know from my own experience that the idea of homework tasks do not go down well. School is where you work and home is for relaxing and fun. However, the programme is adaptable enough that I’m sure the facilitators could incorporate the homework tasks into classroom lessons if necessary, although this would obviously extend the length of the course. From a parent’s point of view, the book provides some good starting points for topics that their ASD child may well ask about outside of school. It can be used to prepare the parent to think about their approach to certain subjects, but it does not give any in depth thoughts into why your ASD child may behave in certain ways. Nor should it, as this book does not pretend to be parent handbook, it is a ‘programme to help young people on the autism spectrum to cope with the challenges of adolescence’. 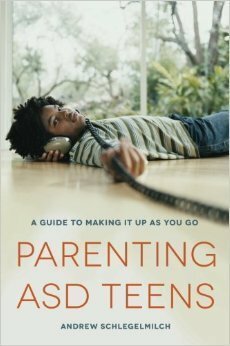 Andrew Schlegelmilch's book, Parenting ASD Teens could not have come into my possession at a more pertinent time. My son, who has a diagnosis of Aspergers, ADHD and ODD, had turned thirteen a few weeks before and this book really helped put certain things into perspective for me. As a parent of a child on the spectrum, I often find it difficult to differentiate between behaviour that is ‘normal’ boy and behaviour that is due to his ASD. Now, to add to the equation, I also have to factor in the hormones of puberty and that gives me three possible choices to go for when trying to work out what is making my son act the way he is. With Andrew Schlegelmilch’s book, I found he gave a brilliant insight into the whys and wherefores of children’s behaviours who were both ASD and Neurotypical. Having a benchmark for what is expected and what is actually your reality enables the reader to assess what intervention might be necessary and also helps you feel less helpless. Schlegelmilch is very good at offering practical pointers and pearls of wisdom that, for me anyway, made me feel I had some kind of control over the situation. As I read the book I couldn’t help but think, “This is my son they are talking about and that explains why he does whatever it is that they were discussing in the chapter.” It clarified many things for me and made me think more about my son’s perspective of things. I didn’t feel that Schlegelmilch was prescriptive or judgemental in his attitude to a parent’s reaction to their child’s behaviours. He merely tries to give a clear and thorough explanation of the reasons why a child might be reacting the way they are and then pointers to help the adult engage more positively and successfully with them. This book is relevant to anybody who would like a better understanding of teenagers with ASD, not exclusively to those parenting a child with it. I have already recommended this book to friends and family and my husband is reading it as I write. Even if only some of what is in the book filters into our family life, I feel there is now more hope for us to get it ‘right’ than had we not had access to this amazing book. I would love to meet Andrew Schlegelmilch and absorb more of his words of wisdom.